All three have now reached the halfway mark in the build. Looking north from Society Road, Queensferry. A rather stilted name for the project to construct a second Forth Road Bridge, as the original  one is wearing out, the Forth Replacement Crossing has now been replaced by the democratically chosen official name. The FRC Bill was approved by the Scottish Parliament in December 2010, and the Bill received Royal Assent in January 2011. 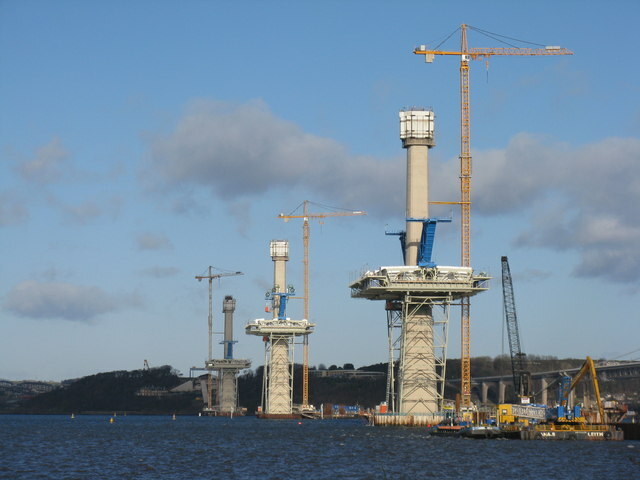 Construction began in September 2011 and the bridge is expected to open in 2016, at an estimated cost of £790m. The constructors are Forth Crossing Bridge Constructors [FCBC], a consortium of four companies [Dragados, Hochtief, American Bridge International and Morrison Construction]. Update August 31 2017. Handed over to the Scottish Government on August 28 2017, with an evening light show - more or less finished, late but under budget; opened to traffic on 30 August for two days, then closed to allow around 50000 people to walk across at the weekend [normally, as a motorway, no pedestrians allowed]; to be officially opened by HM Queen Elizabeth II on 4 September 2017; and finally opened for general use on 7 September. © Copyright M J Richardson and licensed for reuse under this Creative Commons Licence.